DESCRIPTION: Universal stair steps. Uses 2 each 2x6 wood steps or 1 2x12 (not included). Mounts to wood riser (not supplied). Each step requires one pair of brackets. Powder coating heavy gauge steel with screws. Overall length of U-Channel: 12-1/2"
Run/Rise: 10 inch Run with 7-1/2 Rise when assembled. 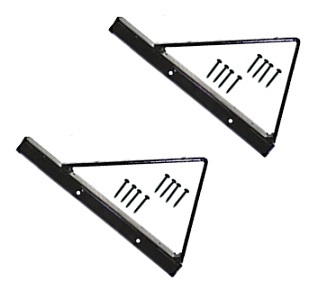 Deck Stair Universal Stringer Bracket Set, for 1 Step. Black Powder Coated Heavy Gauge Steel, with 16 screws, instructions. 2 Brackets/Set, packed in one box. Price/Set.